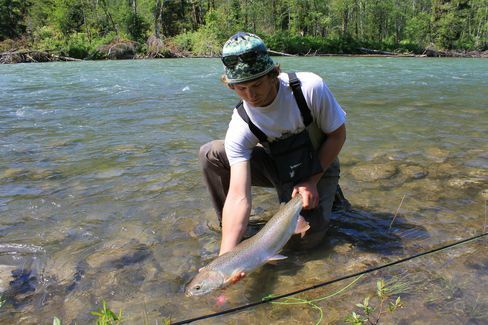 Fancy a visit to the “steelhead capital of the world”? Then try Terrace, in British Columbia, which enjoys exactly that reputation. If you’re after chinook salmon, go there in late summer and fall. For really big steelhead, try fall and winter. 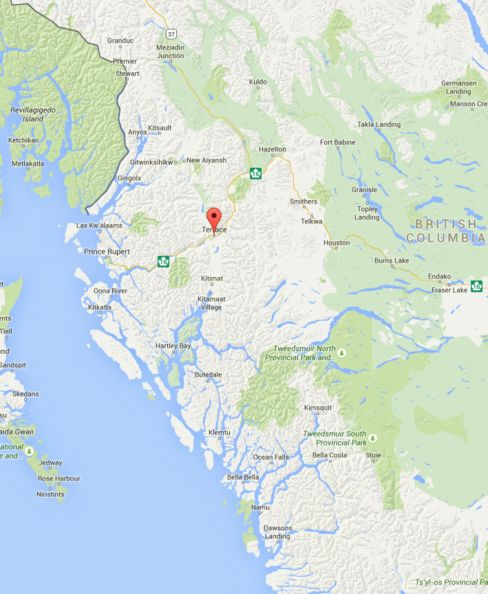 Terrace itself is a small city on the Skeena River, near the Alaska border. It has a population of around 12000, many of whom depend on the annual arrival of fishermen to augment their income. In late May, Peter Redford and Michael Menten enjoyed four days of steelhead bliss (and while steelhead are said to be difficult to hook, read to the end to see what their tally was). There are few things capable of instilling both inner peace and heart-pumping adrenaline within the span of a split second. Swinging flies for powerful spring-run steelhead is certainly one of them. These salmon-size sea-run rainbow trout divide their time between the fast-flowing rivers of the Northwest and the Pacific Ocean. Late summer and fall are your best bet for chinook salmon, while fall and winter provide the best opportunities to land leviathan steelhead. 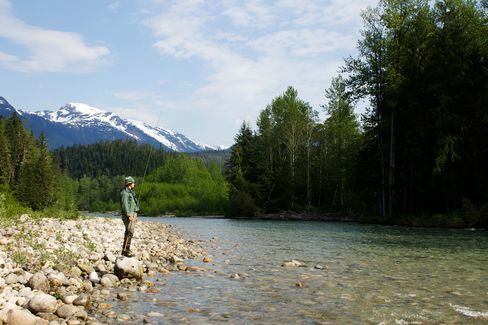 I came in late May, when I joined Michael Menten, a longtime friend turned Vancouver-based fishing guide, on his 16-hour scouting mission north. Inexperienced outdoorsmen venturing into this territory alone court disaster—bears roam the riverbanks, cougars, and wolves prowl the forests. Winter anglers must contend with avalanches. What’s more, accessing the pristine waters can be extremely difficult. In many cases, roads are nothing more than fantasy, while the rivers’ torrid flows can make boating impossible to all but the most experienced. Cue Todd Scharf, a veteran guide and local legend. Along with his wife, Satu, Scharf owns and operates Upstream Adventures, an all-inclusive fishing outfitter that’s become a favorite of the banker set. Upstream’s Terrace lodge is a quintessential fishing base camp: log-built, comfortably furnished with high-ceilinged dining and living rooms, a modern kitchen and bar, and three private bedrooms on the upper floor. An impressive arsenal of jet boats, rafts, and trucks and the services of a local helicopter operator allow Upstream’s expert guides access to the best and most secluded waters around—for about $1,000 a day, all-inclusive. Our initial focus was the Kitimat River, a more manageable watershed by local standards, with a road loosely charting its course making access possible for first-timers like us. The first day of any fishing trip is always the most suspenseful, and as we donned our waders next to a beat of bountiful-looking water, the apprehension in the air was tangible. Menten made the first pass. Two-handed spey casting is the gold standard in these parts, and while Menten was well versed in this technique, I was a complete novice. In an instant, I found myself gift-wrapped in tangled fly line. While I struggled to free myself, Menten’s voice pierced the early morning air: “Fish on!” he yelled, as a flash of chrome scales erupted on the surface. After a lengthy battle (during which I was finally able to free myself), Menten corralled the fish into a calmer side channel, where I tailed it. Catch-and-release being highly recommended, we snapped some pictures; later, Scharf pegged the large, chrome female at 15 pounds. Over the next couple of days, the action on the Kitimat had slowed since our epic start, as the river continued to rise and dirty from the incessant runoff. In fact, all of the glacier-fed river systems were now thoroughly blown, the Skeena so swollen it had burst its banks in parts. Lake-fed rivers and tributaries were thus the only option, as the majority of their inflow was sourced in gin-clear glacial lakes. Luckily Scharf was back, and he had something up his sleeve. Menten battles a steelhead as Scharf looks on, ready with the net. The next day, we set out before sunrise. We tailed Scharf two hours north, deep into virgin wilderness. This was heli-fishing country. We came in the back door—whatever scratches Menten’s truck sustained our tithe. Within the first hour, it paid out dividends. We had three gorgeous fish landed, “farming” another 10. Initially this was a term foreign to me, but it didn’t take long to learn such lingo: “You farmed another one?” Scharf jokingly needled, as I lost fish after fish, all right off the bite. Few things can compare to waking up to the soft whisper of world-class steelhead water, let alone landing yet another enormous fish (likely in the 12-pound range) within 10 minutes of dreary-eyed casting. Our last day on the water was spent alternately taking in the powerful scenery and battling fish after chrome fish. Our final catch count stood at 22 steelhead, fresh from the ocean and big. Not bad for a four-day trip. 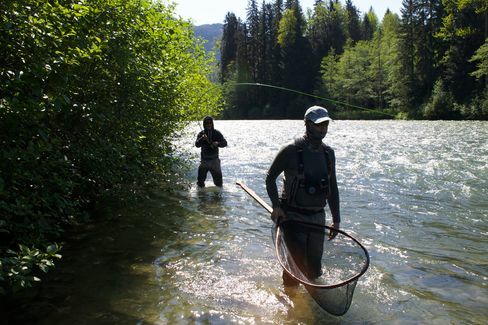 Steelhead may be known as “the fish of a thousand casts,” but in Terrace, who’s counting?